We all know what can happen if the correct techniques are not used when interfacing into the hazardous area. 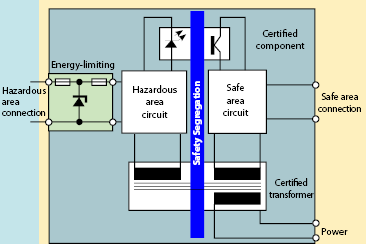 Using intrinsic safety (Ex i based on IEC/SANS 60079-11; IEC/SANS 60079-25), the energy in the hazardous area is limited to below the ignition energy of the gas present, thereby preventing explosions. For an explosion, all three of gas/dust, oxygen and source of ignition (spark or heat) need to be present. Intrinsic safety works on the principle of removing the source of ignition. 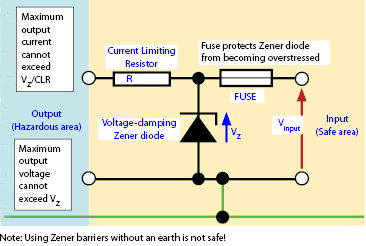 This can be achieved by using a Zener barrier or galvanic isolator. A galvanic isolator is an active device that energy limits without the dependence on the IS earth for safety as shown in Figure 2. It also has the advantage of supplying higher voltage at the hazardous area terminals and allowing longer cable lengths. Isolators have local LED indication and most 4-20 mA isolators transfer Hart communications through the optical isolation. Figure 3 defines Ex i for the various classifications of hazardous zones. 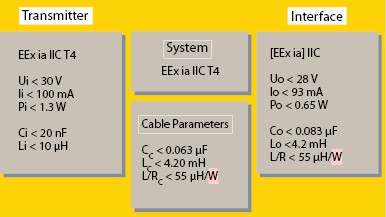 Figure 4 shows that the barrier/isolator has [Ex ia] IIC; the square brackets indicate that the device (mounted in a safe area) can have connections to the hazardous area, in this case Ex ia i.e. zone 0 – IIC is the gas group. This transmitter has Ex ia IIC T4, which means it can be located in zone 0 in gas group IIC – T4 is the maximum surface temperature of the device (135°C). The barrier/isolator has maximum output parameters for voltage, current and power (Uo, Io and Po). These are maximum output values under fault conditions (known as safety description or entity parameters). The field device has maximum input parameters (Ui, Ii and Pi), which are the maximum values that can be applied under fault conditions and still be safe. [Note: for a safe loop all three input parameters must be greater than or equal to the corresponding output parameters. Based on this assessment, a system certificate or loop approval can be documented. [Note: inserting a barrier or isolator with a non-certified field device is not safe.] 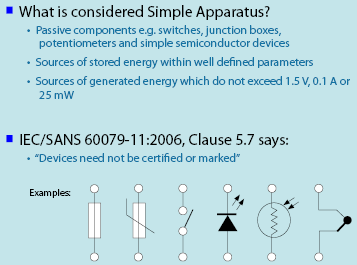 Some field devices (see Figure 5) like thermocouples are defined as Simple Apparatus. A simple loop drawing is still required and an assessment of power/maximum surface temperature needs to be completed. Flameproof (Ex d) offers hazardous area protection for zone 1 and 2 and offers protection for higher voltage (110 VAC, 220 VAC) applications and requires mechanical planning and preparation. 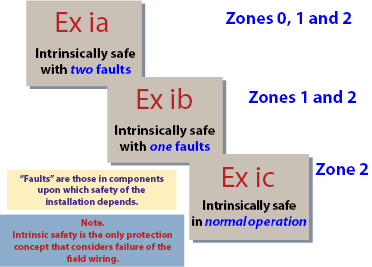 For 24 V systems, intrinsic safety offers a simple and flexible solution for zones 0, 1 and 2. Intrinsic safety is the only protection that considers faults of the field wiring and offers live working without the need for a gas clearance certificate. It does require some design and planning to ensure that the system loop analysis is acceptable. Note: Ex nL has been replaced by Ex ic for zone 2 in the standards. This means intrinsic safety can easily be used in zones 0, 1 and 2 and the wiring can be in the same multi-core cable or trunk. Another advantage of Ex ic is that the safety factor of 1,5 (as shown in Table A.2 of SANS/IEC 60079-11) does not need to be applied to cable parameters allowing for longer cable runs. Is your building safe from fire? Correct selection of detectors is vital.